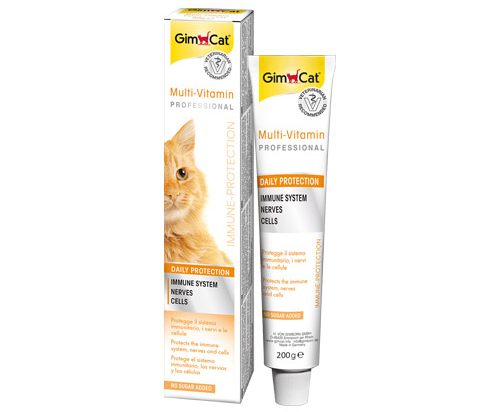 The GimCat Multi-Vitamin Professional Paste contains a special immune protection formula. Highly effective ingredients such as 12 essential vitamins, high-quality linseed oil and beta-glucan strengthen the immune system and help to build up reliable protection against external influences. The linseed oil contains linolenic acid, which forms the basis of omega 3 fatty acids DHA and EPA. These are important for cell production and nerve tissue.